The University of Notre Dame announced Wednesday (Oct.1) the creation of the first new college or school at the University in nearly a century — the Donald R. Keough School of Global Affairs. R. Scott Appleby, a scholar of global religion and a member of Notre Dame’s faculty since 1994, will serve as the Marilyn Keough Dean of the school. 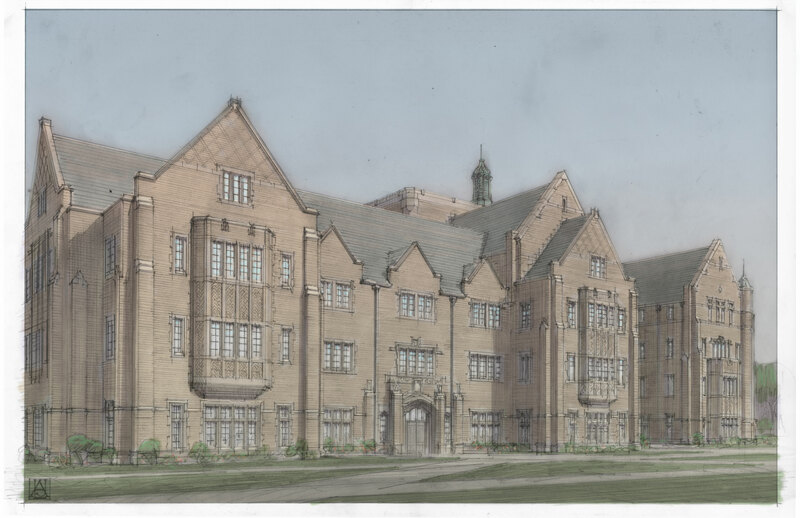 The establishment of the school as well as the construction of Jenkins Hall to house it has been made possible by gifts totaling $50 million from Donald and Marilyn Keough, among the most generous benefactors in the University’s history. Construction of the hall will begin in the spring, and it will open in August 2017. The Keough School will be based in Jenkins Hall, a new building to be constructed on Notre Dame Avenue south of the Hesburgh Center for International Studies near the entrance to Notre Dame’s campus. It is named in honor of Father Jenkins, who has prioritized internationalization at Notre Dame. The school will conduct research on critical issues of international development, peace, human rights and governance; offer a master’s degree in global affairs; and support a range of innovative dual-degree programs and undergraduate programs to enhance students’ preparation for leadership in an increasingly interconnected world. A graduate of Notre Dame, Appleby earned his master’s and doctoral degrees in history at the University of Chicago. His research and teaching at Notre Dame have focused on religious and intellectual history, global religious movements and international peace studies. An award-winning scholar and the recipient of three honorary doctorates, he is a fellow of the American Academy of Arts and Sciences and of the American Academy of Political and Social Science. Providing leadership for the Keough School of Global Affairs is an extraordinary opportunity, Appleby said. Over the next few years, Appleby will recruit new faculty experts in global affairs for the Keough School while also bringing into greater coordination Notre Dame’s strengths in human development, international peace, justice and human rights, global religion and other issues of particular concern to a Catholic research university. International units that will be part of the Keough School include the Keough-Naughton Institute for Irish Studies, the Liu Institute for Asia and Asian Studies, the Center for Civil and Human Rights, the Nanovic Institute for European Studies, the Kellogg Institute for International Studies, the Kroc Institute for International Peace Studies and the Notre Dame Initiative for Global Development. Donald Keough is chairman of the board of Allen & Company Inc., a New York investment banking firm. He retired as president and chief operating officer of The Coca-Cola Company in 1993. A longtime director of the company, he currently serves as an adviser to the board of directors. He has been a member of the University’s Board of Trustees since 1978, serving as chair from 1986 to 1991. In addition to Jenkins Hall, the Keoughs have made several other significant contributions to Notre Dame for a variety of educational and residential initiatives, including the Keough-Naughton Institute for Irish Studies; two endowed chairs in Irish studies; a summer internship program for Notre Dame students in Ireland; Malloy Hall, which houses the Departments of Theology and Philosophy; three library collections; the restoration of O’Connell House in Dublin; the Keough-Hesburgh Professorships for leading scholars who demonstrate a commitment to Notre Dame’s Catholic mission; and a men’s residence hall named in Marilyn Keough’s honor. Their children — Shayla Keough Rumely; Michael, Patrick and Clarke Keough; and Eileen Keough Millard — are Notre Dame graduates. Shayla is a member of the University’s Board of Trustees, and Michael, Patrick, Clarke and Eileen serve on Notre Dame advisory councils. The last college or school established at Notre Dame was the College of Foreign and Domestic Commerce — now the Mendoza College of Business — in 1921.